Culture Calling: Tell us about The Lift Up Café, what’s it like? Sian Evans: It’s a small, independent café that I've designed and built myself, heavily influenced by world flavours. I’ve travelled a lot and picked up inspiration from various countries in terms of flavour and spices. We’re quite coffee-focussed too. Our ethos is about supporting other independent businesses in the building and the local area, so we stock Coffee Advocates coffee and other Manchester-made drinks. It’s got a nice cosy atmosphere in here, we have leather couches, and it’s just a cool place to hang out and drink coffee and eat homemade cake. CC: Sounds like what you might need after a hard day on the slopes? SE: Exactly! We get a lot of skiiers and snowboarders coming in for their morning coffee, and then they pop back for their lunch, maybe a sit on the couch to rest their legs. CC: What’s on the menu? SE: Everything’s home-cooked and reasonably healthy – we do do All-Day Breakfasts but we don’t have a fryer or microwave, so everything's grilled or oven-baked. We do lots of wraps: there’s a crispy Jerk chicken one with carrot and red cabbage coleslaw and black beans, an 8-hour slow-cooked Indian spiced lamb one, a Japanese one, a Moroccan one… we do a few sandwiches too and plenty of vegan food. Lots of the staff here at Chill Factore are vegan so I’ve been busy finding out what kind of things they want! CC: Do you have a bar? SE: Yeah we serve craft beers from Blackjack Beers, soft drinks from the Steep Soda Co, Moss Cider, we’ve got Thomas Dakin gin – all of those are Manchester-based companies, I’m pleased to say. Our tea’s from Mad Hatter Tea, based in Yorkshire – a little further afield, but it's excellent! CC: How did it come about, have you run cafes before? SE: I have, yes, I’ve been working in the hospitality industry since I was about 13 and I’m 30 now, so more than half my life! I started as a pot-washer, then moved on to prepping food; I’ve been a restaurant manager, kitchen manager, head coffee barista in Australia… And it’s hard work and long hours, but I’ve always loved it – and always wanted to have my own place, so this was an opportunity that came along and I grabbed it! CC: And have you worked in a skiing environment before? SE: I’ve worked two ski seasons and on the first, when I was managing a chalet, I learnt to snowboard properly. I actually first went on a snowboard here at the Chill Factore, so this is where I first developed my passion for snowboarding and the mountains. Having people coming in in their ski boots and still wearing their ski gear makes me feel really happy, like I’m doing a season again – but working for myself this time! It’s nice having customers I have something in common with so we can chat about where they’re going skiing on holiday and have a bit of a laugh – I always ask them “how’s the mountain today?” when they come off the Chill Factore slope. CC: What’s the Chill Factore like? 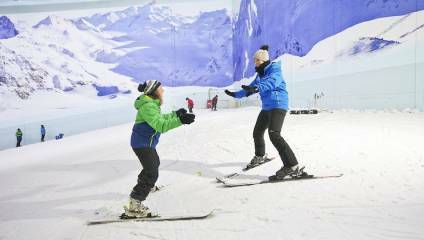 SE: It’s the UK’s longest real snow slope at 180 metres, and it’s really cold in there. It’s like a giant freezer; I think they keep it at about -3 or -4 degrees. There’s a Costa and a Wetherspoons when you first come in, and a lovely little ice cream place nextdoor to us. There’s also a snowboarding shop – it’s very outdoorsy. There’s a climbing wall too. The whole centre is called Beyond now, so the Chill Factore is just the skiing bit, and it’s a really cool building with lots of lovely people who have skiing and snowboarding in common. It’s a good little community. CC: Are you planning on having any events? SE: I’m an artist, so I’m hoping to organise a pop-up gallery at some point, and a couple of the staff who work here are involved in the music scene and put on jam nights and things, so we’d like to hold some band nights too. There are a loads of events that happen here at the Chill Factore so we’d definitely like to be part of that.